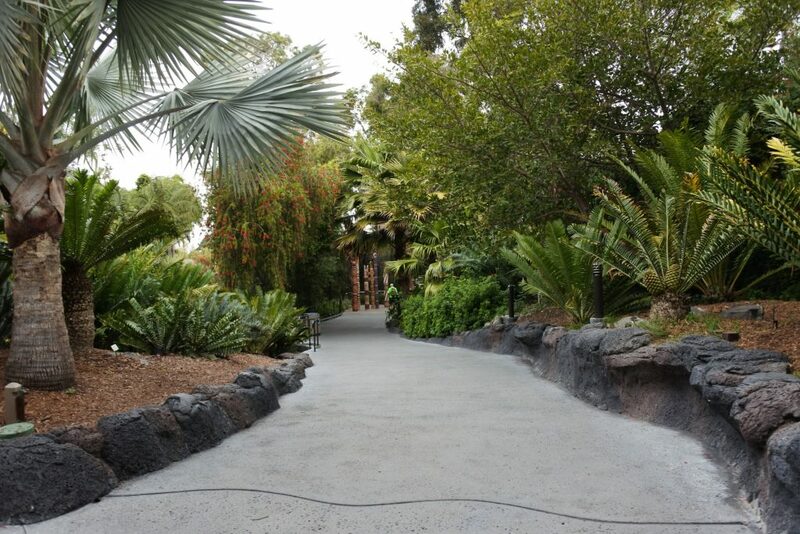 Are you considering skipping the San Diego Zoo because you are short on time? Don’t! 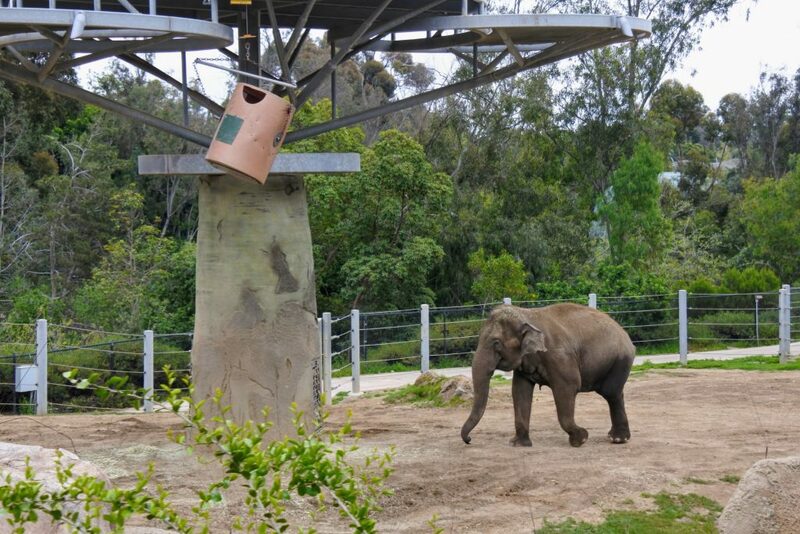 Visiting the San Diego Zoo is a lot of fun. We saw pandas, polar bears, and more in only 4 hours. 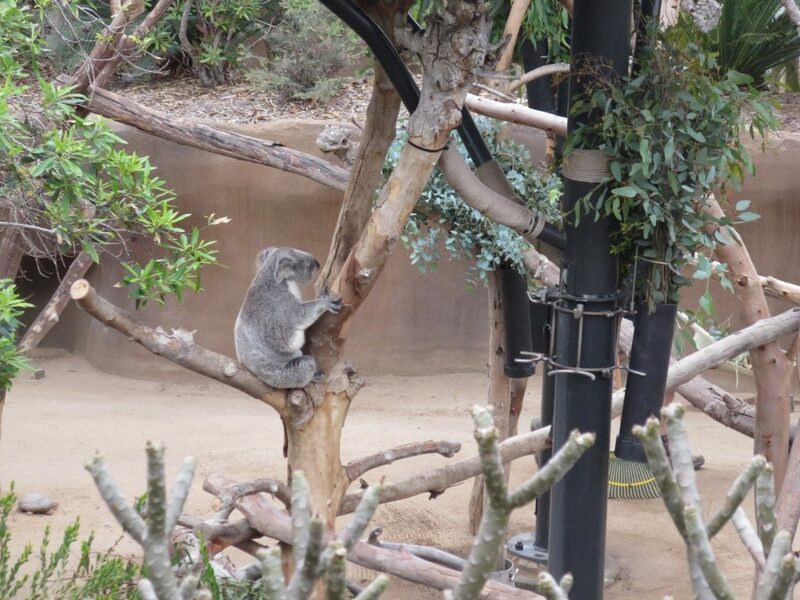 Let me tell you how to see (almost) all of the San Diego Zoo in a half day. This way you will still have plenty of time to experience our other favorite San Diego family activities. We arrived at 8:50 am for a 9:00 am zoo opening. At this early hour there were plenty of free parking spots available. 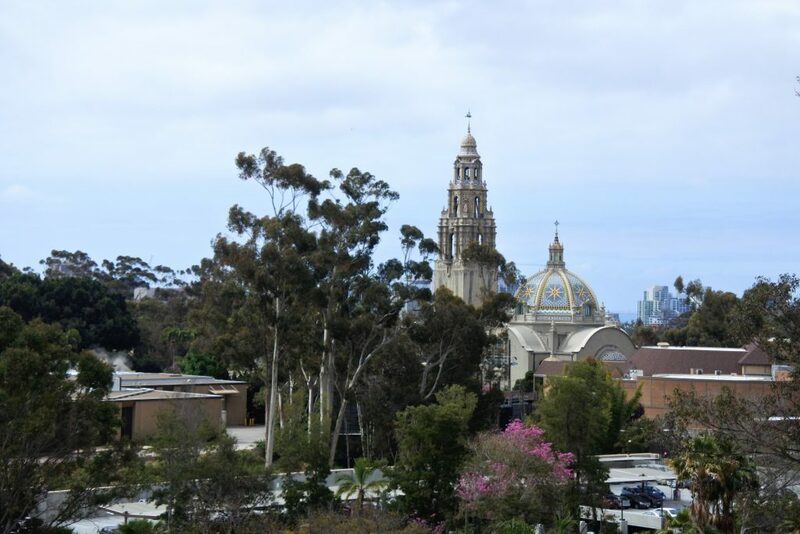 This parking spot is especially awesome since from the zoo you can explore more of Balboa Park by walking. This way you can park once, but explore a ton of different places. We were able to purchase our tickets (check prices) in person before the zoo officially opened. This allowed us to enter the zoo right at opening. If you prefer, you may pre-purchase your tickets online from home. In addition to the basic entrance admission there are several tour options available for purchase. If you want to do one of these enhanced tours make sure you register in advance (way in advance for Early Morning with Pandas). Be aware the pricing you see for the tours does not include your entrance fee. Our number-one priority for the morning was to see the panda exhibit before the wait got long. 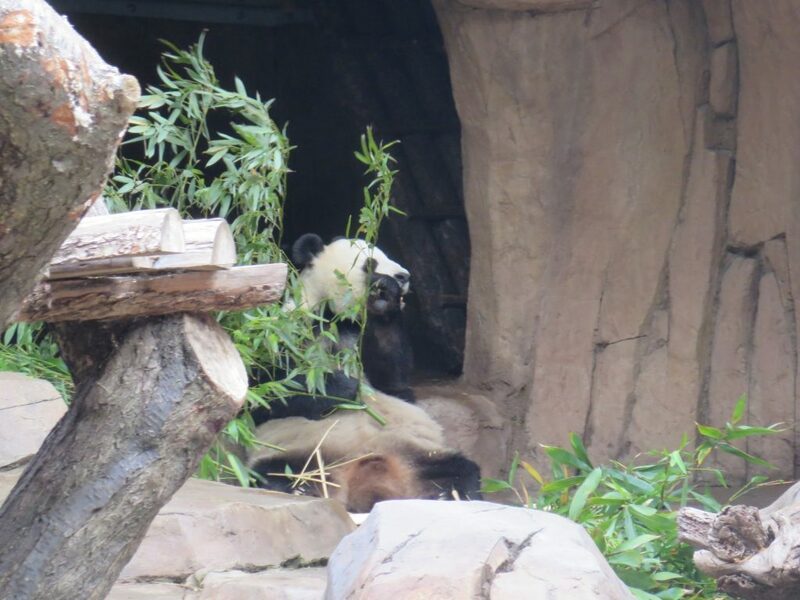 The Giant Pandas are now found in the Panda Trek area of the zoo located towards the back of the zoo. On our last visit the pandas were in a temporary location near Asian Passage not too far from Panda Trek. We grabbed a map and took a right onto Front Street until it met up with Center Street. Here we turned left onto Center Street and walked past the temporary panda exhibit until we reached the actual entrance to the exhibit. Even though we did not take the shortest route we arrived at the entrance to the temporary panda exhibit around 9:15 am. Please note: Now that the giant pandas are back at Panda Trek I would expect the walk to take a few minutes longer than ours. 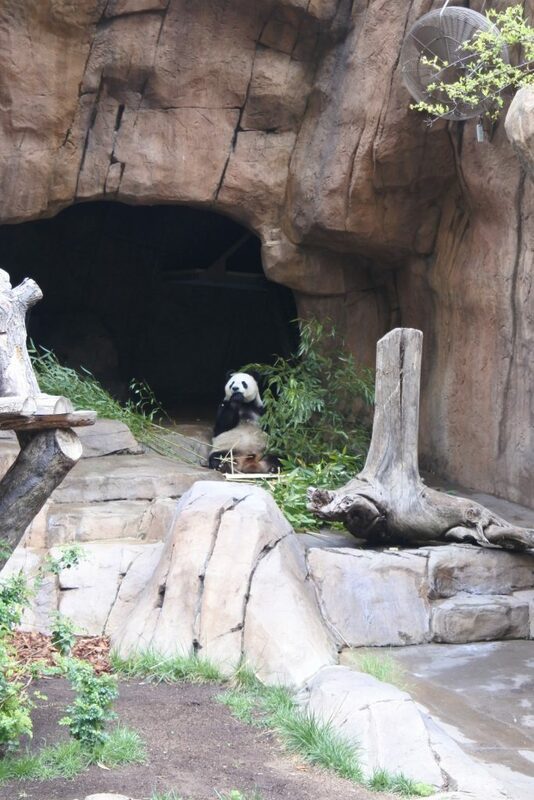 We did not have long to wait at all to see Bai Yun and Xiao Li Wu. Our viewing spot was right along the railing and we were able to see them each having some breakfast bamboo. After we had taken all of the pictures we had hoped for and watched them eat breakfast we took the Lost Forest Path back up to the main entrance. BTW – I think people are obsessed with pandas because they look like people are inside a panda suit. At least that is why I am. Once we were back at the main entrance to the zoo the guided bus tour was easy to find. Just follow the signs. This double-decker bus takes you around the zoo and provides a great overview of the park. It also saves you a lot of walking. This zoo is huge. And hilly. If you have a stroller, there is a stroller parking lot located nearby the guided tour area. The bus tour is a loop so you end up where you start. This makes it easy to pick your stroller up after the tour. The bus is two levels, and the wait for the upper, open-air deck was a little longer than for the bottom. The extra wait was worth it in our opinion. Our seats were on the passenger side of the bus. The passenger side allowed us to see an amazing variety of animals from the comfort of our seats (although I think the view on both sides was pretty darn good). There were only a couple of exhibits where we had difficulty seeing the animals. Our views were pretty amazing, huh? I could not believe all of the animals we were able to see on the tour! Not only do you see the animals, but the bus driver tells you all about them as you go. Pro tip: Our driver/tour guide said that a slightly cool, overcast morning like we had was great for seeing animal activity. She said that the animals tend to be less active on brighter, hotter days. I had been disappointed at first by the weather, but it was actually a happy accident! At the end of the 35-minute guided tour we had seen pretty much every animal we had hoped to during our visit. 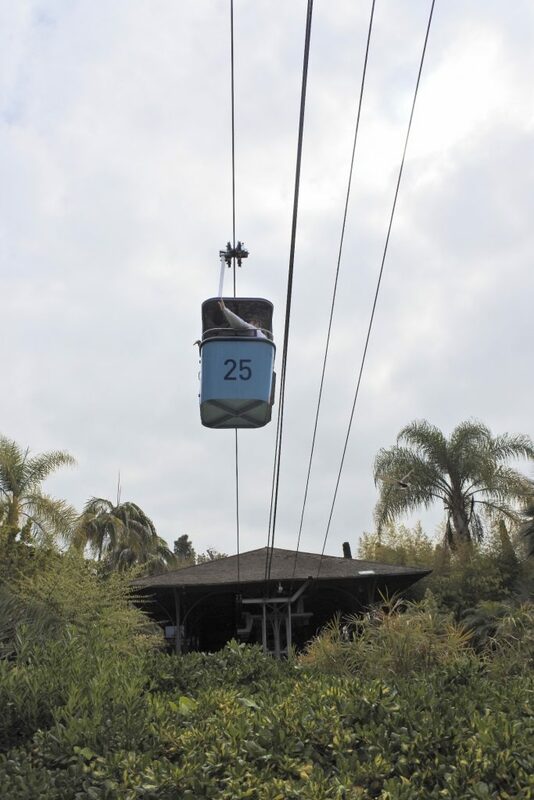 When researching the San Diego Zoo I kept seeing talk of the Skyfari tram. This aerial tram takes you from one corner of the park to the other over the treetops in an open air gondola. Obviously we needed to try it out. The line at the Skyfari East stop (near the Wegeforth Bowl) was to the very end of the marked queue. It took us about a 20-minute wait until we reached our gondola. This aerial tram has only one stop at the edge of the zoo near the Northern Frontier. Warning – if you are afraid of heights this is not for you. The gondolas are open air and sway quite a bit up in the sky. Only strollers that fold smaller than 23-3/4 inches (60 cm) wide can go on the gondola. If it is a larger stroller, a zoo rental stroller, a jogging stroller or double stroller these must be left in the parking lot near the Skyfari Tram. There is a maximum of 4 persons per gondola (that total includes all ages of children). 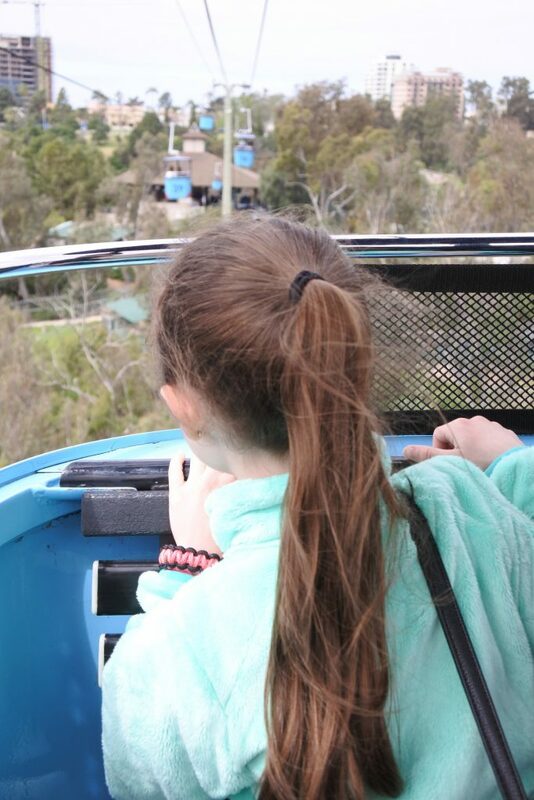 The Skyfari was a peaceful and quick way to cross the whole zoo. 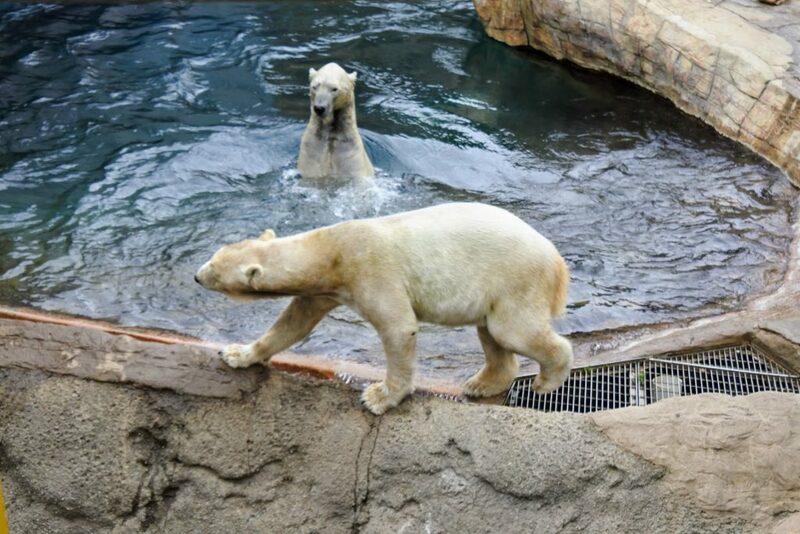 We exited the gondola and made our way to the Northern Frontier to see the polar bears again. Now that we were on foot we were also able to see reindeer and the arctic fox. From here we walked back to the Skyfari Tram West stop to grab a ride to the front of the zoo. When we arrived back at the Skyfari East stop it was only a little after noon, and we had seen everything on our bucket list. We congratulated ourselves and decided to treat ourselves to lunch at Prado (yum yum!) before exploring the Japanese Friendship Garden (which was Elizabeth’s #2 choice of what to visit in Balboa Park). 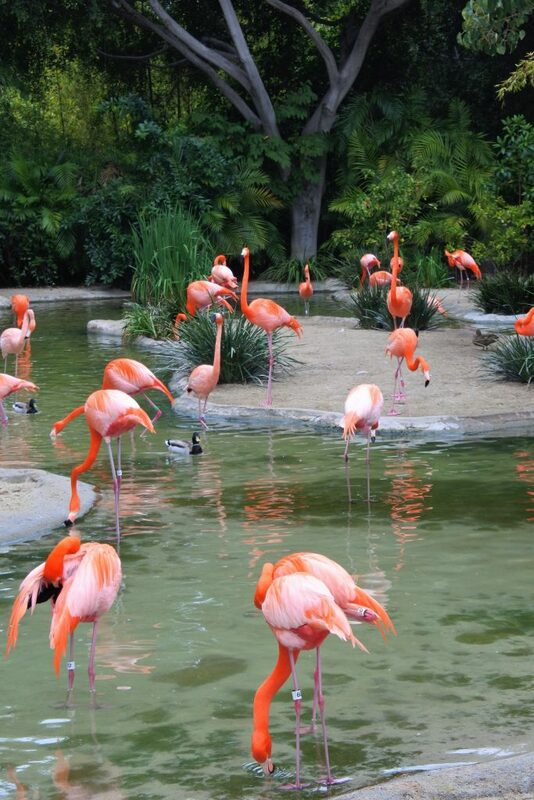 The San Diego Zoo was an excellent stop on our trip around Southern California. Although expensive, seeing our second set of pandas (we saw them in Washington, D.C. previously) and admiring the thoughtful exhibits made this a good experience. 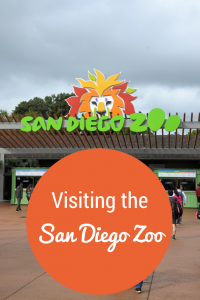 If you would like to spend more time at the San Diego Zoo, there is even more to do than I outlined. 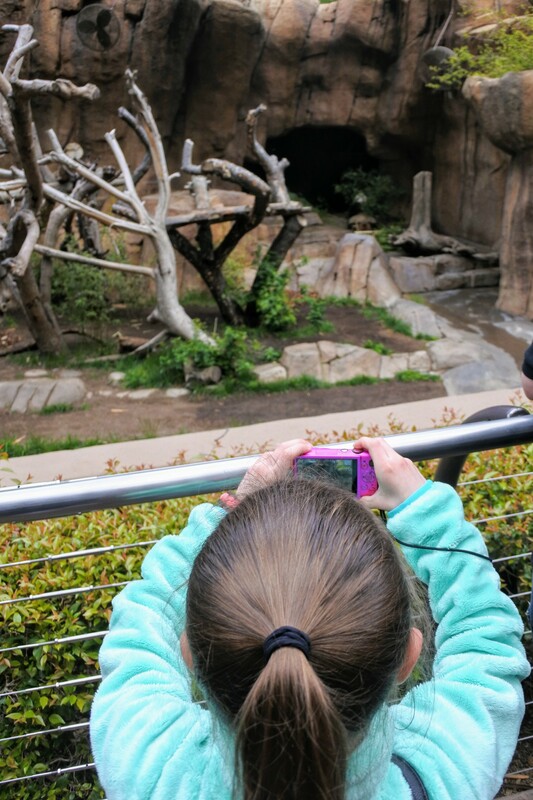 For example, you can go through Scripps Aviary to admire the birds, take time to see the animals more up close and personal than you did in the guided bus tour, or watch a 4-D movie. Or if you really want some exercise, skip the guided tour and walk around the 100-acre zoo with tons of hills (if that’s your thing). 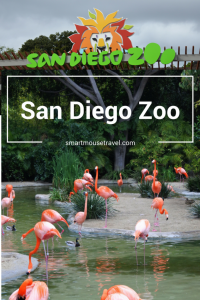 I hope that this half-day plan convinces you that visiting the San Diego Zoo is possible even with time constraints. We were truly pleased with our experience and amazed at all we did in only 4 hours. What a great post. Have pinned this one. 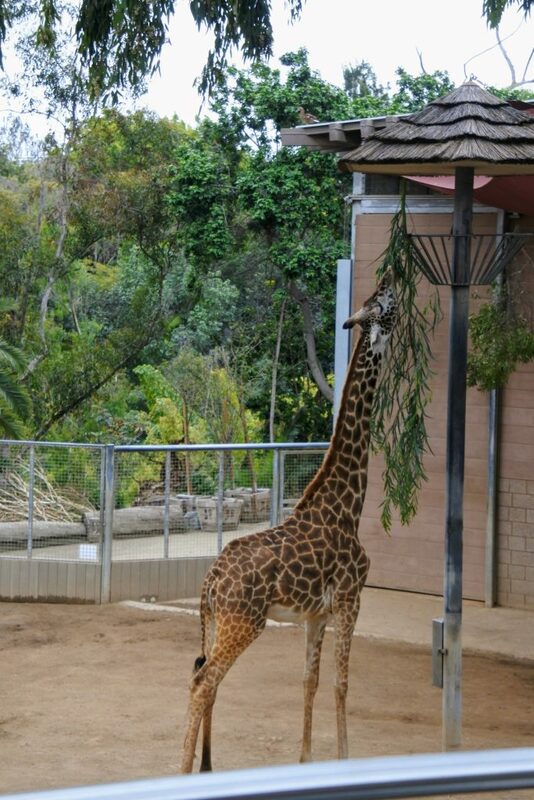 Wow, what a great and fun experience in the San Diego Zoo. Thank you for sharing.